Tennessee vs USC, ROSE BOWL Football Game Program, January 1, 1945, Pasadena. This 36-page Program is in VG-EX condition, and it is complete with nothing missing. 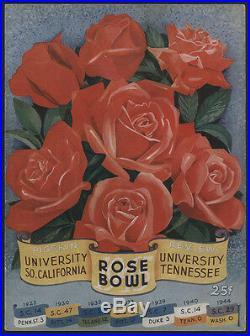 The item "1945 Tennessee vs USC, ROSE BOWL Football Game Program" is in sale since Saturday, February 25, 2012. This item is in the category "Sports Mem, Cards & Fan Shop\Vintage Sports Memorabilia\Publications\Programs\College - NCAA". The seller is "amazing-adventures" and is located in San Francisco, Calif.. This item can be shipped to United States, Canada, United Kingdom, Denmark, Romania, Slovakia, Bulgaria, Czech republic, Finland, Hungary, Latvia, Lithuania, Malta, Estonia, Australia, Greece, Portugal, Cyprus, Slovenia, Japan, China, Sweden, South Korea, Indonesia, Taiwan, South africa, Thailand, Belgium, France, Hong Kong, Ireland, Netherlands, Poland, Spain, Italy, Germany, Austria, Israel, Mexico, New Zealand, Philippines, Singapore, Switzerland, Norway, Saudi arabia, Ukraine, United arab emirates, Qatar, Kuwait, Bahrain, Croatia, Malaysia, Brazil, Chile, Colombia, Costa rica, Dominican republic, Panama, Trinidad and tobago, Guatemala, El salvador, Honduras, Jamaica, Bahamas, Viet nam, Uruguay, Luxembourg.